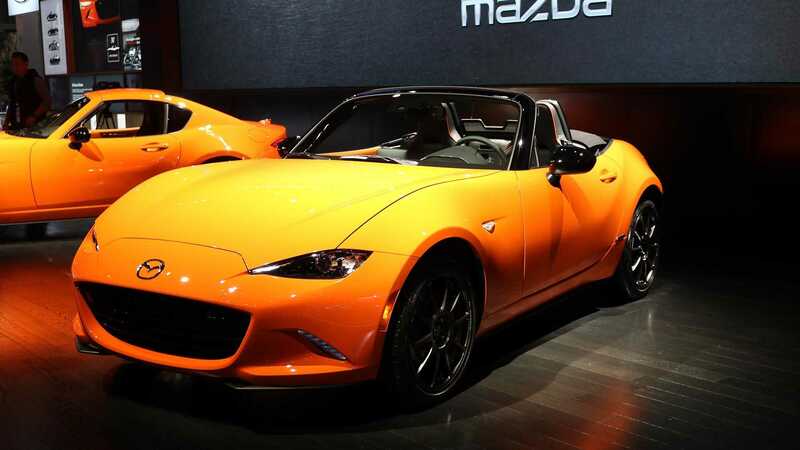 A special series celebrating 30 years of the Mazda MX-5 roadster has debuted at the Chicago Auto Show earlier today. The two-door vehicle sports a Racing Orange paintjob, brand-new forged wheels, Bilstein shocks, a manual differential (only available with manual transmission), and performance brakes (Brembo in front, Nissin at the rear). The inside space of the Mazda MX-5 30th Anniversary Edition holds Recaro sport seats draped in leather and Alcantara, a multimedia system with smartphone support, a high-end Bose audio system consisting of 9 speakers, and a special dash plaque in testimony of the limited series. From the mechanical point of view, though, the roadster still ships with the old 2.0-liter naturally aspirated engine good for 184 hp (137 kW). European customers may also opt for a more affordable 1.5-liter version with 132 hp (98 kW). Transmission choices are limited to six-speed manual and automatic.